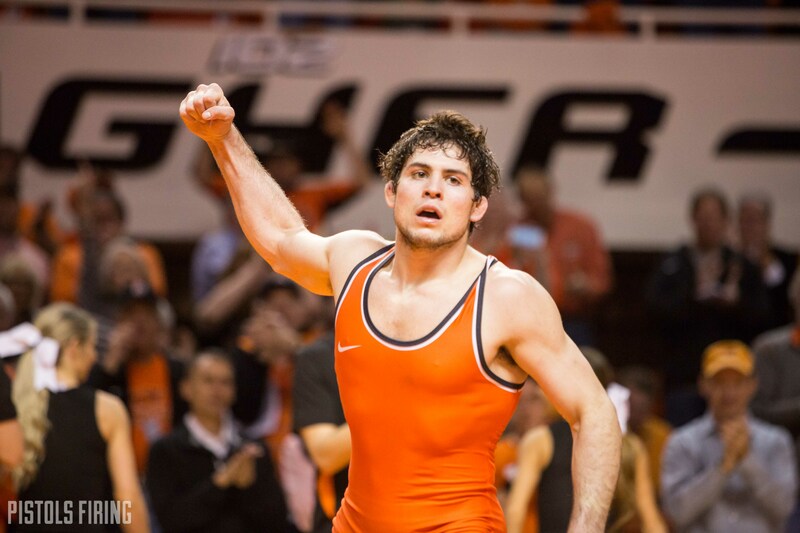 OSU moved to 12-0 with a 27-6 win over Lehigh in Gallagher-Iba Arena on Sunday. Here’s how it went down. I don’t know what John Smith’s lineup plans are for when Chandler Rogers returns from injury. Andrew Shomers was the starter prior to Rogers going down, so the assumption would be he’ll jump back in at 157. Wyatt Sheets has been great in his place, though. Sheets had a lead late in the third and was taken down. This sent the match to sudden victory where Sheets notched a quick takedown to score an overtime upset over 14th ranked Humphreys. One of the more intriguing things about this dual involved two guys that didn’t even wrestle. All-American’s Chandler Rogers and Preston Weigel both have missed a large portion of the season due to injury. Both weighed in both came out for warm-ups. Obviously neither wrestled, so they must not quite be ready to go. It’s certainly promising and a sign that they may be close to return if they’re weighing in and rolling around for warm-ups. Derek White picked up another solid win against 7th-ranked Jordan Wood of Lehigh. He continues to impress and solidify himself as an NCAA title contender. There are some huge matchups on the horizon for him vs. Missouri and Iowa. With OSU having a shot at a potential average attendance record I’ve been watching those numbers closely. Northern Iowa and Lehigh did not have the attendance of the other duals we’ve seen this season. With Air Force and Iowa the two home matchups remaining OSU will need a total of 14,681 attendees to break the record. Iowa should be a big crowd, but they’ll still need better numbers vs. Air Force to have a shot at the record.